True to its mission to promote awareness and acceptance of autism and advocate for the rights of persons with disabilities (PWDs), the Autism Society Philippines gave two separate lectures on Understanding Autism and Republic Act (RA) 9442 last July 19 and 20, 2012, in celebration of the 34th National Disability Prevention and Rehabilitation (NDPR) Week. The lectures were done in partnership with the Local Government Units (LGUs) of Cainta, Rizal headed by Mayor Mon Ilagan and San Juan City Mayor Guia Gomez, and facilitated by their respective PWD Focal Persons, Analee Lacampuenga (Cainta) and Rocel Camagos (San Juan). 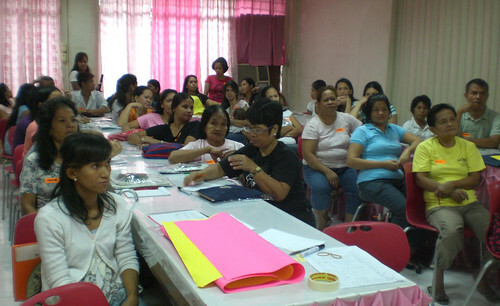 The activity in Cainta was attended by more than 50 parents of children with autism and other disabilities as well as special education teachers of the municipality with Ms. De Guzman, the Municipal Welfare and Development Office and Ms. Ilagan, the First Lady of Cainta as special guests. Ms. Ilagan affirmed the Mayor’s support for the welfare of children with disabilities. In San Juan City, the participants were parent beneficiaries of the Conditional Cash Transfer Program of the government, parents of children with disabilities and persons with disabilities. The participants were so grateful to acquire new knowledge on autism for them to understand and be more compassionate of families affected with the condition. They were also grateful to know the benefits and the rights of PWDs as provided by the law. “Now that I know the law, I can ask for the discounts that my child is entitled to, and I can also demand that the rights of my child be respected." said a mother. Those who are interested to conduct a lecture on autism and RA 9442 may contact ASP National Office at 929 8447, 926 6941 or email at autismphils@gmail.com.